Accurate Truck Service, LLC (Accurate Truck Service) is a full-service medium and heavy duty truck repair center located in Grand Rapids, MI. We offer a wide range of power-train, brakes, transmission, electrical and body work services for diesel engine trucks. Accurate Truck Service also provides roadside assistance services within the general geographic area of West Michigan. 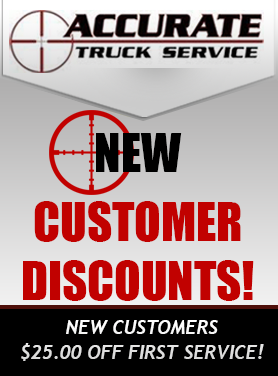 Quality service is a staple of the Accurate Truck Service business. With a team of highly-skilled technicians and service professionals, Accurate Truck Service is committed to providing its customers with the best in truck maintenance, repairs and breakdown services. Getting you back on the road, quickly and safely, is the Accurate way.